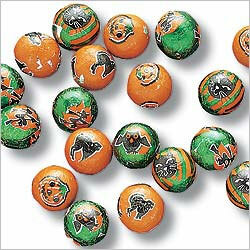 We make Halloween candies and stock foil wrapped novelties all year! 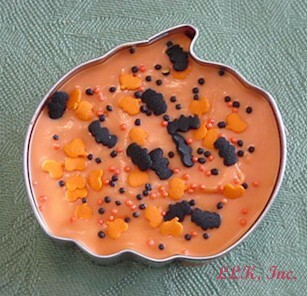 Click on pictures to enlarge - Halloween Items Are Available All Year. 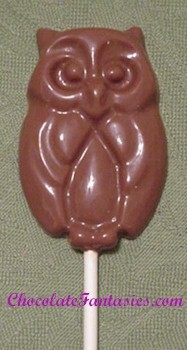 5 ounces. Gift boxed, tied with stretch ribbon. 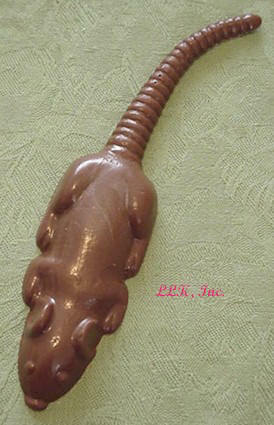 Delicious chocolate filled cookie cutter. 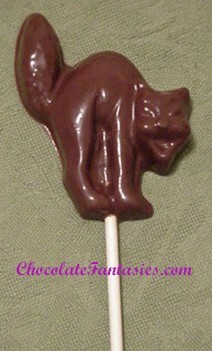 Just pop out the chocolate and enjoy. Cookie cutters are ready for reuse. Poly bag, tied with ribbon. 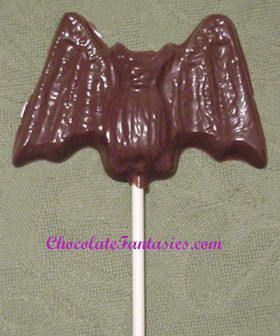 Other Halloween shapes available by special order: Witch, scared cat, spider, etc. Please email or call for prices. Cookie cutters are also for sale without chocolate. 3 oz. 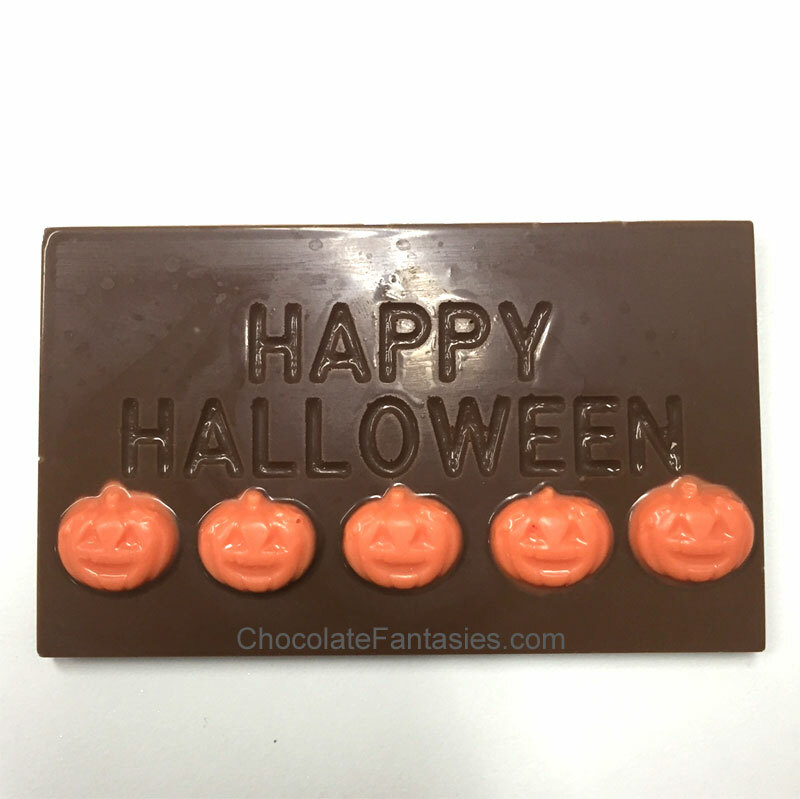 card that says, "Boo!" 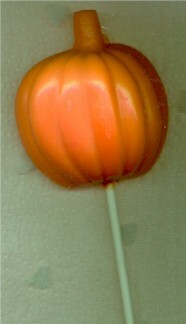 under the pumpkin. Gift boxed, stretch ribbon. 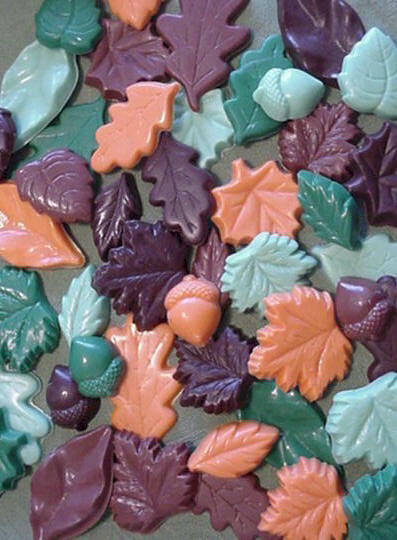 1.2 ounces, Poly bag, tied with ribbon. 1.5 ounces, Poly bag, tied with ribbon. 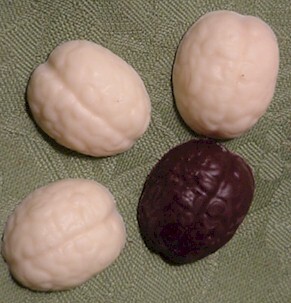 3 color in white chocolate as shown. 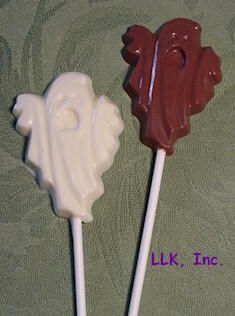 Ghost Trio Lollipop - $3.00 - 4.00 ea. Poy bag, tied with ribbon - 1.2 ounces, 2 1/2". 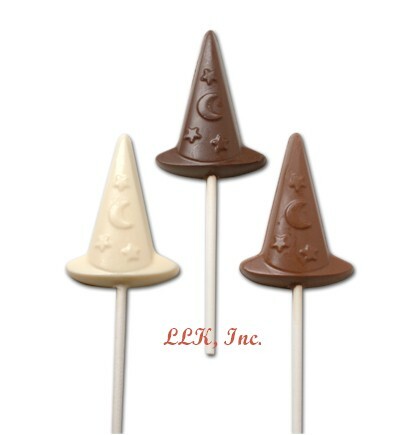 Available in plain or two tone as shown in milk or dark chocolate. 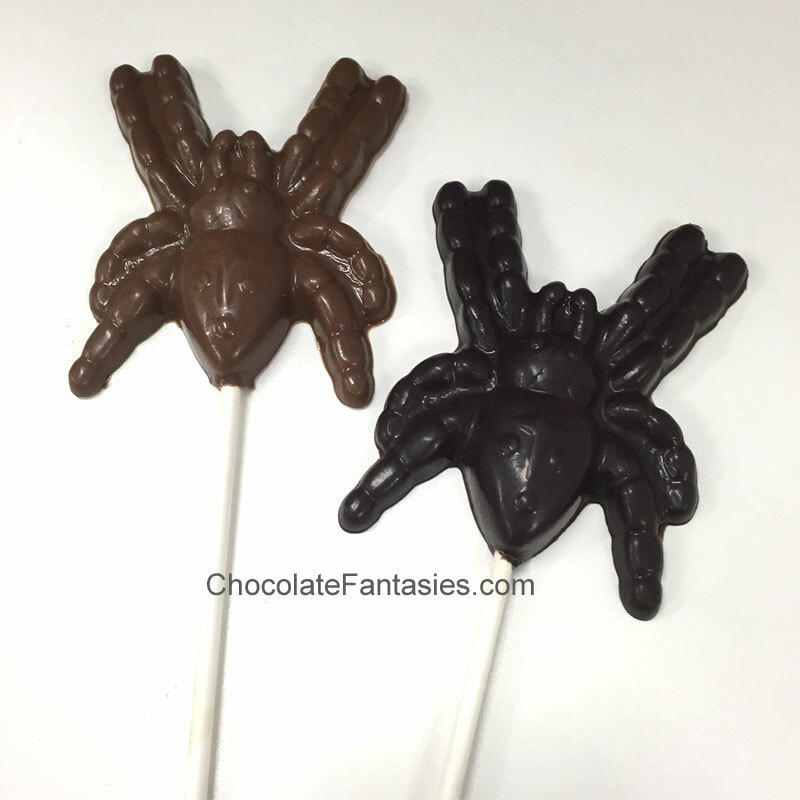 Chocolate Spider Lollipop - $2.50 ea. 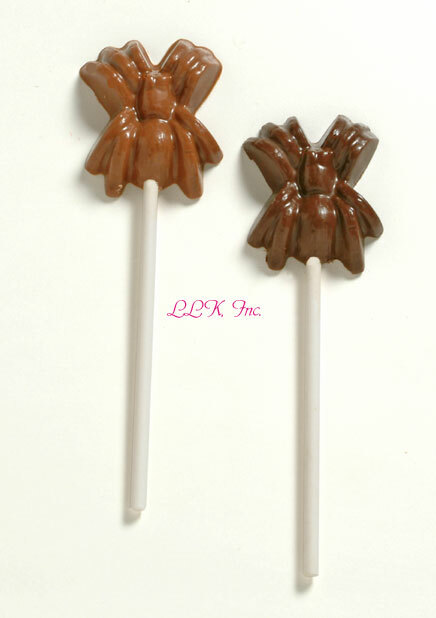 Large Chocolate Tarantula Lollipop - $3.00 ea. 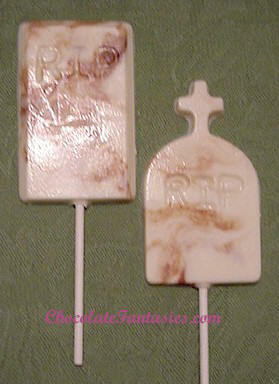 Gravestones Lollipop - $2.50 ea. 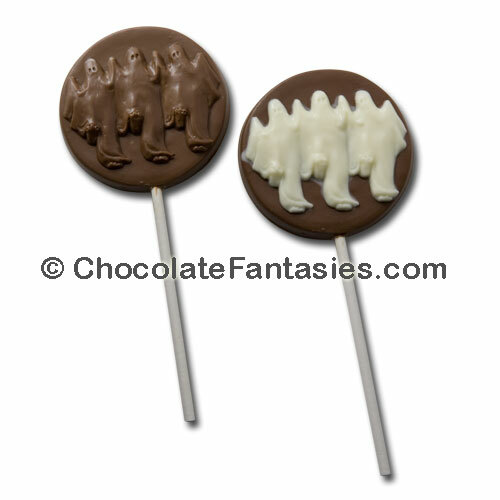 These are great to stick into a cake. 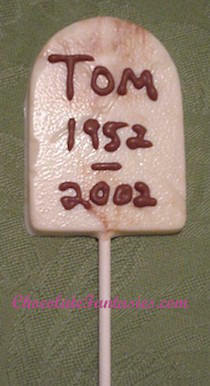 Please email us after you place your order with personalization. 6 letters maximum. 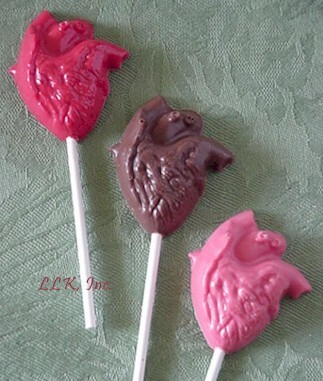 Anatomical Chocolate Heart Lollipop - $2.50 ea. 1 Ounce - Poly bag, tied with ribbon. 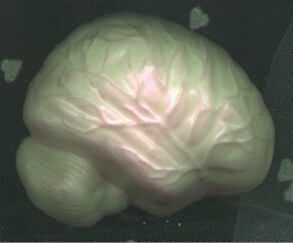 7.3 ounces, for one hemisphere, 14.6 ounces for full brain - Poly bag, tied with ribbon. 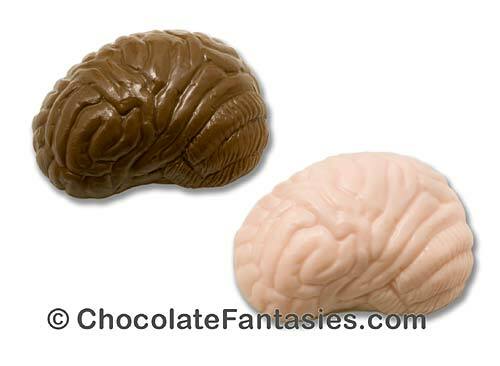 Medium Brains - $3.00 ea. 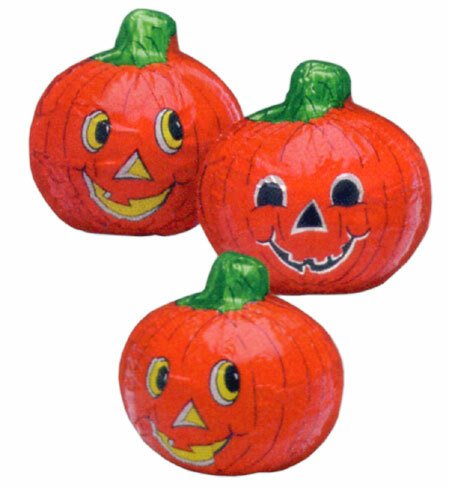 1.8 Ounces, 1.75 x 2.75", one hemisphere - Poly bag, tied with ribbon. Gift Boxed, tied with ribbon - 2.5 ounces, about 8-10 pcs. Size of a walnut half. 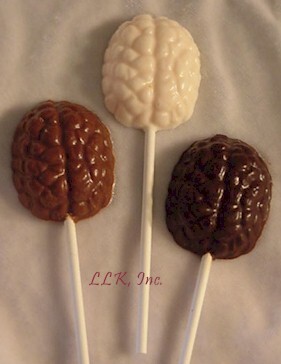 Brain Lollipop - $1.80 ea. 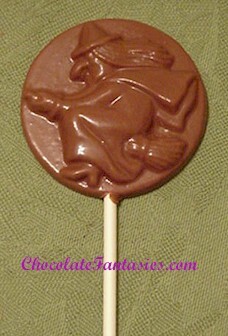 .8 ounce - Poly bag, tied with ribbon. This incredibly detailed hand is brushed with edible greenish glow powder. 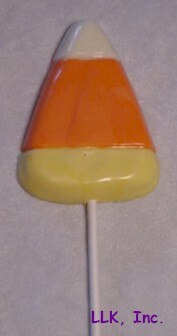 Poly bag, tied with ribbon - 1.4 ounces. Approx. 4". 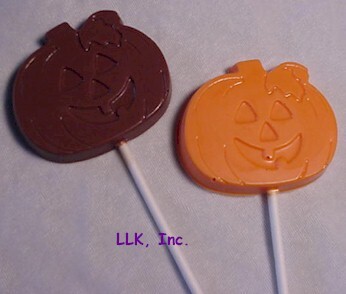 Dapper Skeleton Lollipops - $3.50 - 4.50 ea. Poy bag, tied with ribbon - 2 ounces, 1 1/2 x 4 3/4. Available in plain, two tone or shimmer dusted. 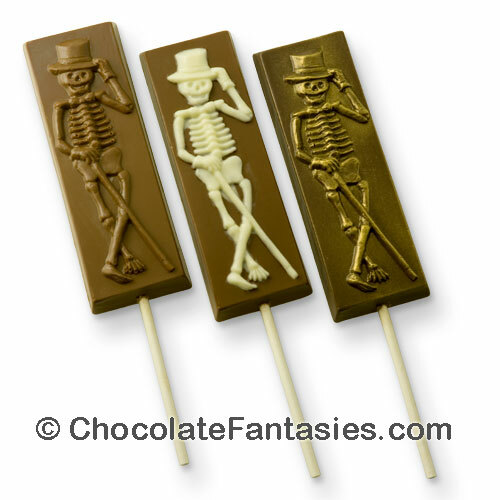 Shown left is plain milk chocolate, middle is white skeleton with milk chocolate background and right is gilded skeleton in milk chocolate. 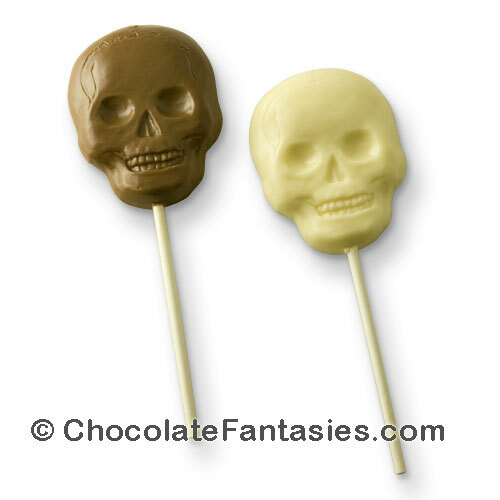 Happy Skull Lollipop - $2.75 ea. 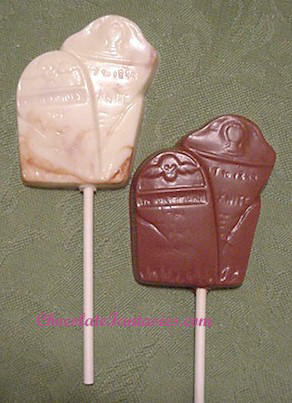 Love Skull Lollipop - $2.75 ea. 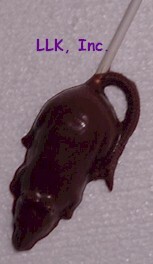 Poy bag, tied with ribbon - 1.4 ounces. Gift box of 5 with stretch ribbon or individually poly bagged tied with ribbon. Approximately 2.5". 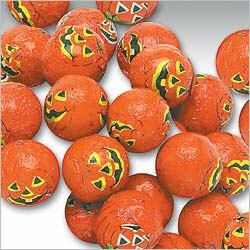 Large Skull Face - $14.99 ea. 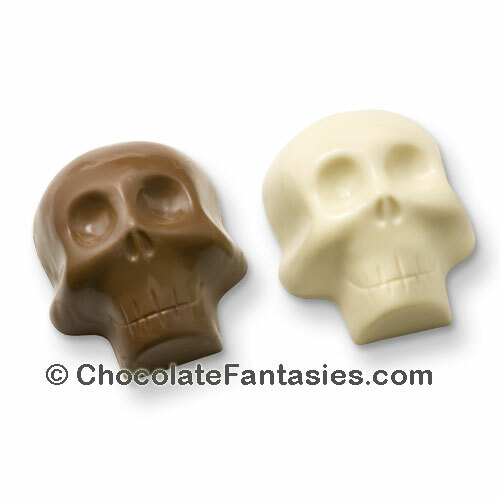 This stylized skull face is perfect for Dia de los Muertos celebrations too. Poy bag, tied with ribbon - 17.9 ounces, 4 3/8 X 5 1/4 X 2 1/2". 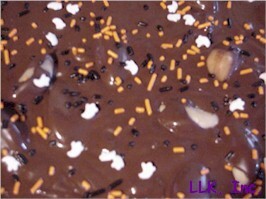 Sprinkled with Halloween jimmies and ghosts. Gift boxed tied with ribbon. 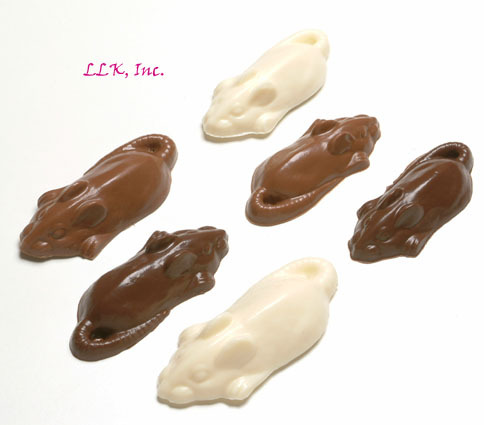 Chocolate Rat - $6.00 ea. 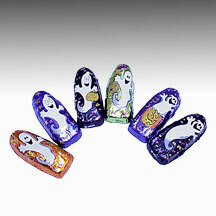 Set of six in gift box or set of two in Poly bag tied with ribbon. 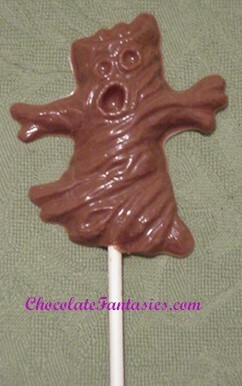 Chocolate poop available with candy corn & gummy worms too, ew! 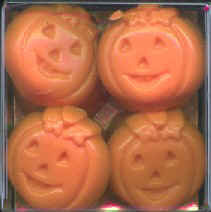 Trick or treat?! 4.4 ounces, poly bag, tied with ribbon. 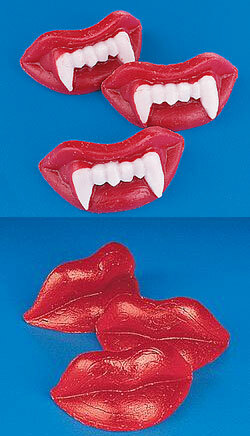 Wax Lips or Mustache - $1.29 ea. 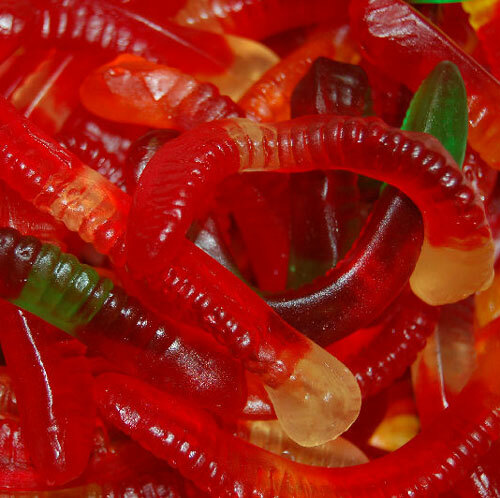 Cherry flavored, fun wax chewing gum. Choose from grape flavored black mustache or red lips. 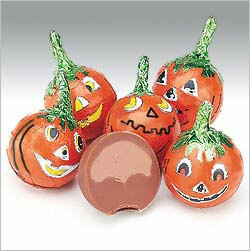 Semi-solid milk chocolate pumpkin in hard foil assorted happy jack-o'-lantern faces. 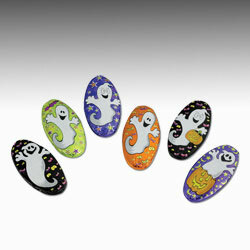 Case has two counter top displayers with 24 pieces in each delivered from NY only. 24 pc. 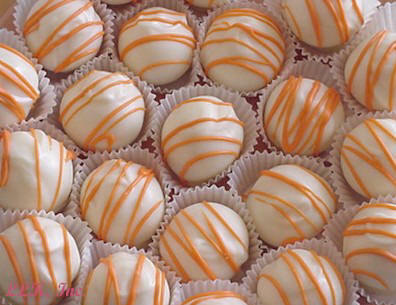 box is special order and limited in quantity. Really nice sized 2 7/8 x 2 11/16 x 2 7/8, 2 oz. ea. Kosher OUD. 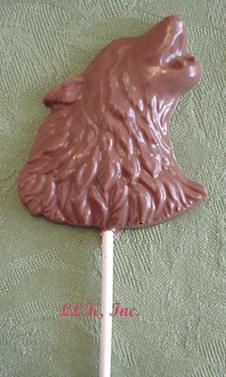 Click Here for Autumn & Thanksgiving chocolates!